Standard room comes with Queen bed, featuring TV/Foxtel, fridge, microwave, kettle, tea & coffee making facilities. 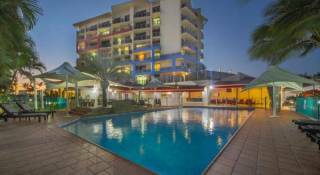 air conditioning,ensuite, ceiling fan, table and chairs (indoor & outdoor), free Wi-Fi. Covered parking, outdoor smoking only. Standard room with a Queen and a single bed, featuring TV/Foxtel, fridge, microwave, kettle, tea & coffee making facilities. air conditioning, ceiling fan, table and chairs (indoor & outdoor), free Wi-Fi. Covered parking, outdoor smoking only thanks. Self contained room featuring a digital TV/Foxtel and queen bed. Kitchenette with hot plates, toaster, microwave, kettle, fridge. tea & coffee making facilities, air conditioning, ceiling fan, table & chairs (indoor & outdoor), Wi-Fi. outdoor smoking only. Self contained room featuring queen and single bed, TV/Foxtel, kitchenette with hot plates, toaster, fridge, microwave, kettle, tea & coffee making facilities, air con, ceiling fan, table and chairs (indoor & outdoor), free Wi-Fi. Outdoor smoking only. Self contained room featuring double bed & 2 single beds. 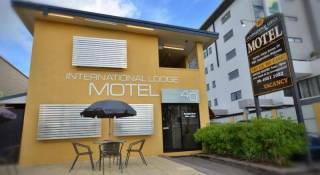 TV/Foxtel, kitchenette with hot plates, toaster, fridge, microwave, kettle, tea & coffee making facilities, air con, fan, table and chairs (indoor & outdoor), free Wi-Fi. Outdoor smoking only. 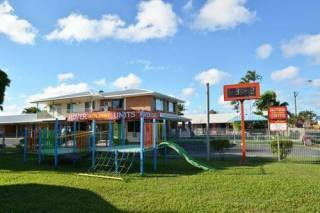 Cool Palms is the closest motel on the motel strip to Mackay city centre. Not only is it centrally located but it's also the best value too. All rooms are air conditioned and come with fridge, microwave, tea and coffee making facilities, free Wi Fi and Foxtel. There are standard, self contained and family rooms to choose from with disabled access to facilities & some rooms. 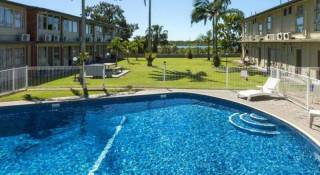 The beautifully landscaped pool area comes complete with a covered barbecue area which is perfect for making the most of Mackay's ideal climate. This motel has covered, off street parking, a laundry service and you can even get breakfast delivered to your door. 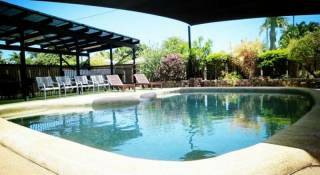 Why not book your next stay at Cool Palms Motel, Mackay? It's just what you need. One free, covered car space is provided for each room booked, limited additional parking for trailers, MR & high clearance vehicles is available upon request. Payment Policy 100% of the first night payable at booking, balance to be paid at check-in. Cancellation Policy *If cancelled or modified up to 2 days before date of arrival, no fee will be charged. *If cancelled or modified later or in case of no-show, 100 percent of the first night will be charged. Cool Palms Motel is located at 4 Nebo Road, Mackay, Queensland, 4740. Conveniently positioned, whether you are arriving in Mackay via the airport, bus station, train station or driving. Located directly opposite Mackay Toyota, at the Shakespeare St lights, diagonally opposite Mackay Showgrounds on the Bruce Highway route through Mackay.